Let junk mail senders or anyone else know that you wish to be removed from their mailing list. Includes a convenient space on which to attach a mailing label. 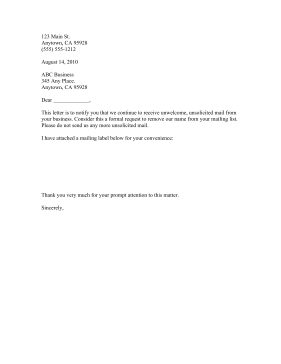 This letter is to notify you that we continue to receive unwelcome, unsolicited mail from your business. Consider this a formal request to remove our name from your mailing list. Please do not send us any more unsolicited mail. Thank you very much for your prompt attention to this matter.